The first step of understanding and calculating torque is identifying the moment arm. The moment arm (lever arm) of a force system is the perpendicular distance from an axis to the line of action of a force. In other words, moment arm determines the quality of the torque. An important concept to remember is that the moment arm changes with the angle of application of the force (angle of insertion). Simply stated, torque is the ability of a force to cause rotation on a lever (moment of force). The more detailed definition of torque is that it is a force applied over a distance (lever arm) that causes rotation about a fulcrum (axis of rotation). Torque is what creates biomechanical movement. It is what creates the movement of the lever system (bones). This is important to understand. Being able to maximize the amount of torque a muscle can generate will allow for optimal strengthening of that muscle. The greater the torque a muscle can produce, the greater the movement it will produce on the body’s levers. If your goal of treatment is to increase movement, you can manipulate the torque variables to maximize the efficiency of the muscles to move the body part. The barbell biceps curl exercise provides a great example of this. It’s much harder to move the bar when your elbows are fully extended compared to when they’re at 90°. This is because of the angle-torque relationship. In this relationship, the greatest amount of torque is always when the force is applied at a 90 degree angle to it’s lever. This concept can also be used with the opposite goal in mind. By adjusting the angle of application and moment arm, you can change the force vector components and increase the amount of compressive force. Increasing the compressive force is often the goal when attempting to maximize stability. The rotator cuff demonstrates this type of force vector when the muscles synergistically contract to create a compressive force couple to stabilize the humeral head in the glenoid fossa. When attempting to manipulate torque, it is important to realize that the joint ROM does not always correlate with the amount of torque a muscle can create. The angle of insertion is independent of joint ROM. There are many muscles that cross joints that have many different insertions. 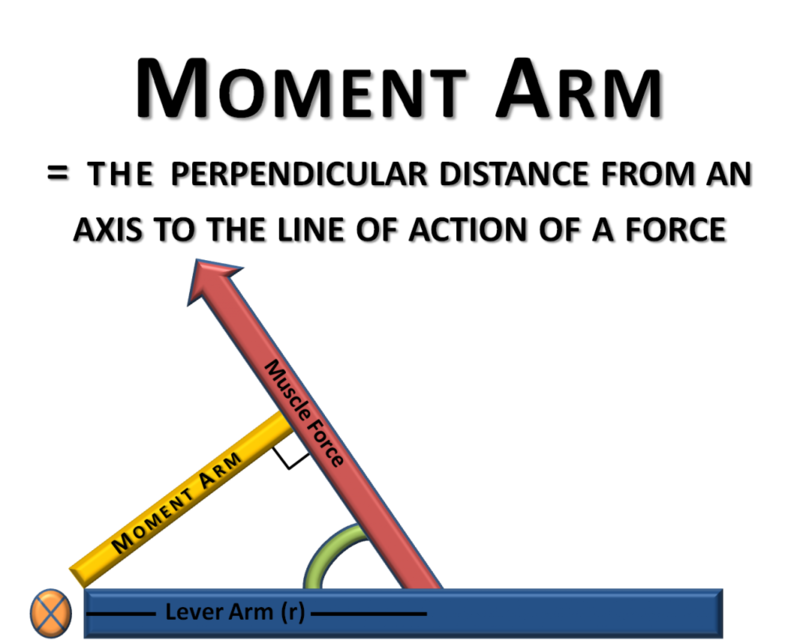 To determine the force vectors (torque and compression) of a muscle, one must evaluate the line of pull in relation to the lever arms and joint axis. 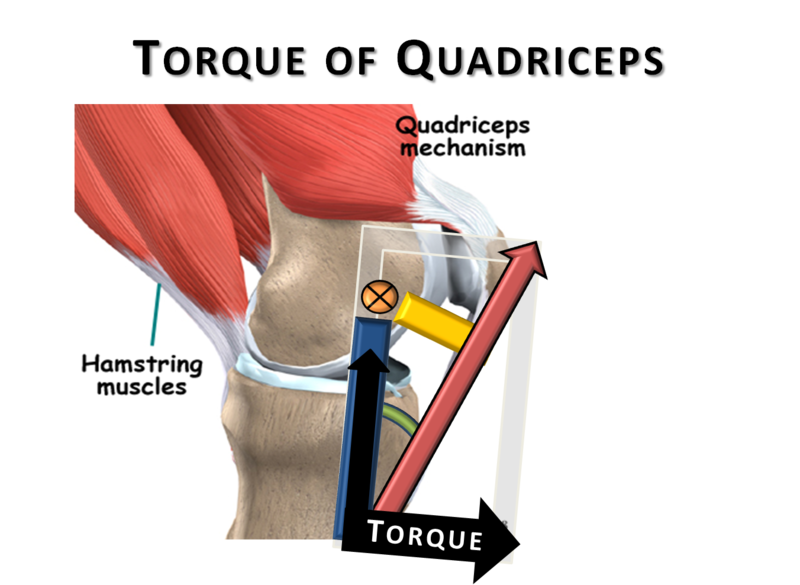 A common example of the effect of moment arm and angle of application have on torque is the patella’s affect on quadriceps torque. As you can see below, the patella bone increases the angle of application of the quadriceps tendon and therefore moment arm, thus increasing the amount of torque the quadriceps can create. Without the patella most of the quadriceps force would create more of a compression/joint stability moment. Torque is the driving force for human movement. Being able to manipulate the target muscle torque will allow for a more specific intervention. Moment Arm of a force system is the perpendicular distance from an axis to the line of action of a force. 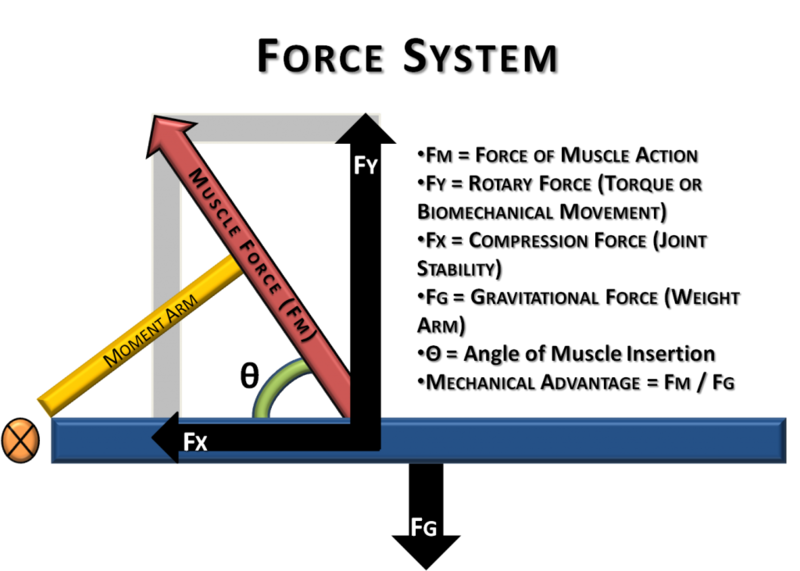 Hello- the explanation was helpful : the relationship between torque, moment arm and forces (resistance, effort). What type of torque will be formed when the LOG passes anteroirly and posteriorly to an axis respectively?